A view of Sanur beach. 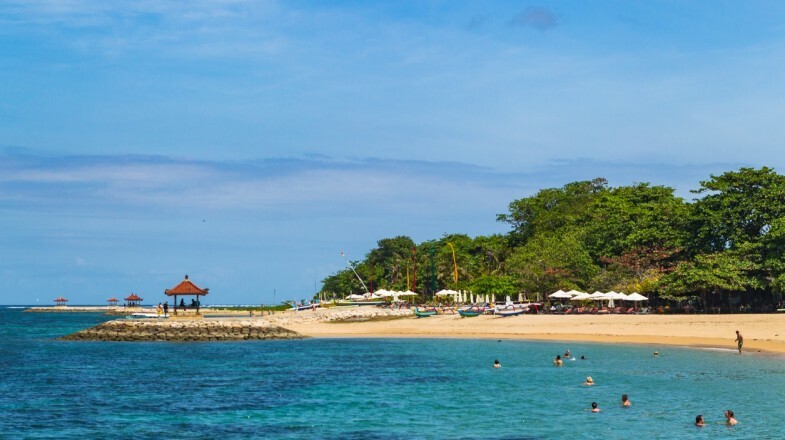 If you are looking for an idyllic Bali getaway distant from the noisy resorts and crashing waves, then holidays in Sanur is just the thing for you. This dreamy village, which is nestled on the east coast of the island, is known for its pleasant beaches and low-key atmosphere. Trip to Sanur is also a great option for families, as this Balinese resorts boasts calm waters and plenty of children-friendly activities. Blanjong Pillar is the oldest and most intriguing sight in Sanur. It was erected in the 10th century, during the rule of the first Balinese king Sri Kesari Waemadewa. Sanur promenade is a paved walkway that runs along the coast, ideal for afternoon strolls. The promenade is also lined with many cafés and restaurants if you feel like stopping and enjoying the fabulous views with a refreshment in your hand. Museum Le Mayeur holds an intriguing collection of paintings created by Belgian artist Adrien Jean Le Mayeur, who settled in Bali in the 1930s. The museum, which is located in Le Mayeur’s former house, also contains a small souvenir shop. Jalan Danau Tamblingan, the main street in Sanur, is your go-to place for any and all shopping purposes. In this shop-lined street, you will find local handicrafts, including wood carvings and colorful paper kites. If you’re flying into Bali Ngurah Rai International Airport, you can reach Sanur via taxi – the ride should take about 20 minutes. Sanur is also serviced with bus transport from other major resorts in Bali including Ubud, Kuta and Candidasa. Sanur is the ideal spot to treat yourself to a relaxing spa treatment, which Bali is famous for. All bigger hotels host in-house spas; there are also several independent businesses in town. If you find yourself in Sanur in July, then you must visit the International Kite Festival. During this vibrant event, villages from all over Bali construct their own kites, which can reach up to 10 meters in length.